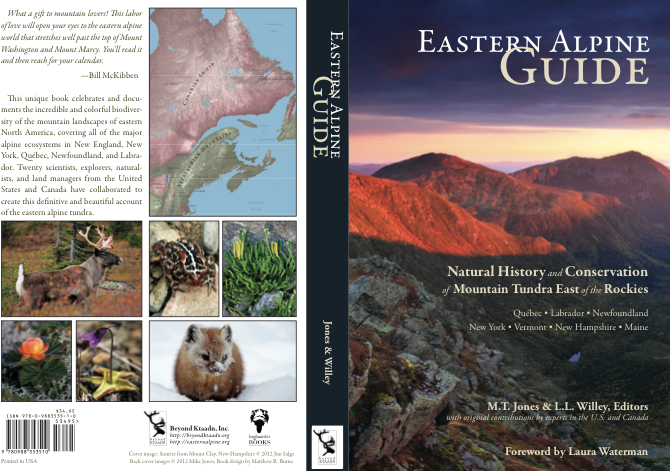 Eastern Alpine Guide: Natural History and Conservation of Mountain Tundra East of the Rockies, edited by M.T. Jones & L.L. Willey, 2012, reprinted 2018. This unique and impressive book, commissioned by the nonprofit Beyond Ktaadn, is a guide to, and celebration of, the alpine ecosystems of New England, New York, Quebec, Labrador, and Newfoundland. Twenty scientists, explorers, naturalists, and land managers from the U.S. and Canada contributed to this profusely illustrated guide. Part I covers geology, climate, vegetation and fauna. Part II covers New Engalnd and the Gaspe. Part III covers Newfoundland, and Part IV covers the Canadian Shield. Hundreds of gorgeous color photos 368 pp., 6" x 9."